The Trifid Nebula, also known as Messier 20 (M20), is a large star-forming region located in the southern constellation Sagittarius. The nebula’s name means “divided into three lobes,” and refers to the object consisting of three types of nebulae and an open star cluster. The open cluster is surrounded by an emission nebula, a reflection nebula, and a dark nebula within the emission nebula that gives M20 the trifurcated appearance for which it is known. The dark nebula was catalogued by Edward Barnard and has the designation Barnard 85 (B85). 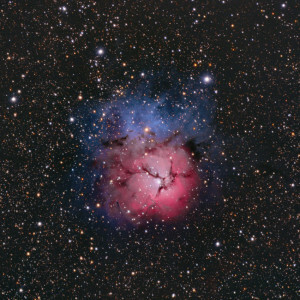 The Trifid Nebula has the designation NGC 6514 in the New General Catalogue. Messier 20 is a popular object among amateur astronomers because it is quite bright and easily observed in small telescopes. It has a diameter of 42 light years and lies at a distance of 5,200 light years from Earth. M20 has an apparent magnitude of 6.3 (a magnitude of 9.0 is sometimes given) and can be seen in binoculars, but is best observed in larger telescopes. In the northern hemisphere, the nebula is best seen in the summer months, when Sagittarius climbs higher in the sky. The Trifid Nebula lies only 2 degrees to the northwest of the larger Lagoon Nebula (Messier 8), another famous deep sky object in Sagittarius. It is even closer to Messier 21, an open cluster of stars located only 0.75 degrees to the northeast of M20. 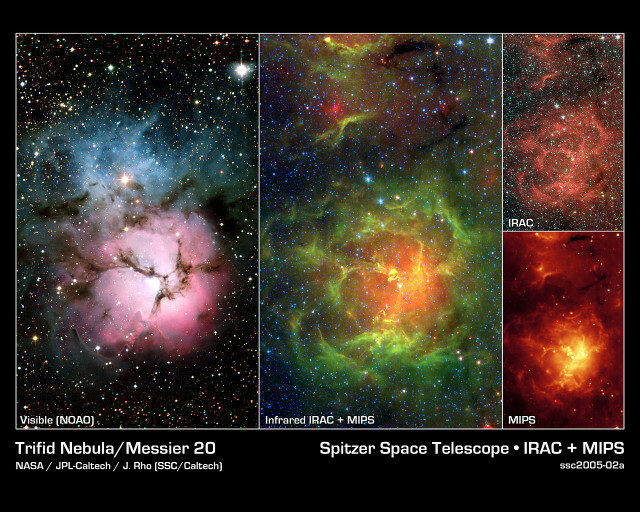 For observers in the northern hemisphere, the best time of year to observe the Trifid Nebula is from spring to early fall. In the summer months, Sagittarius is highest in the sky around midnight or 1 am on July 1, around 10 or 11 pm on August , and around 8 or 9 pm on September 1. The easiest way to find the Trifid Nebula is to start from the Teapot asterism in Sagittarius and find the tip star, Kaus Borealis (Lambda Sagittarii). With an apparent magnitude of 2.82, Kaus Borealis is bright enough to be seen without binoculars. Following the line from the star northwest toward the Lagoon Nebula leads to the optical binary 7 Sagittarii. The bright cluster of stars embedded within the Trifid Nebula lies about 2 degrees north. 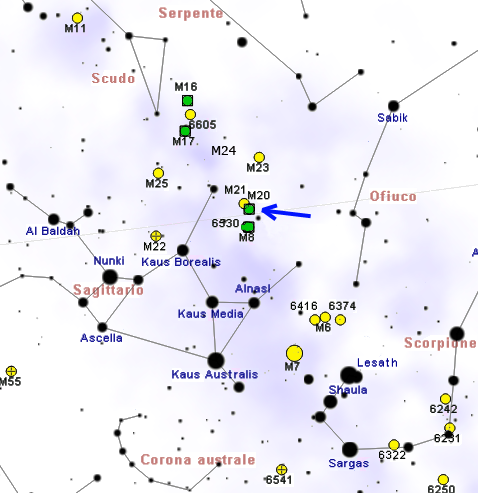 The smaller compact cluster to the northeast of M20 is M21. In binoculars, the nebula appears as a fuzzy circular patch. Small telescopes (80 mm or 3.1-inch) reveal the dark dust lanes. 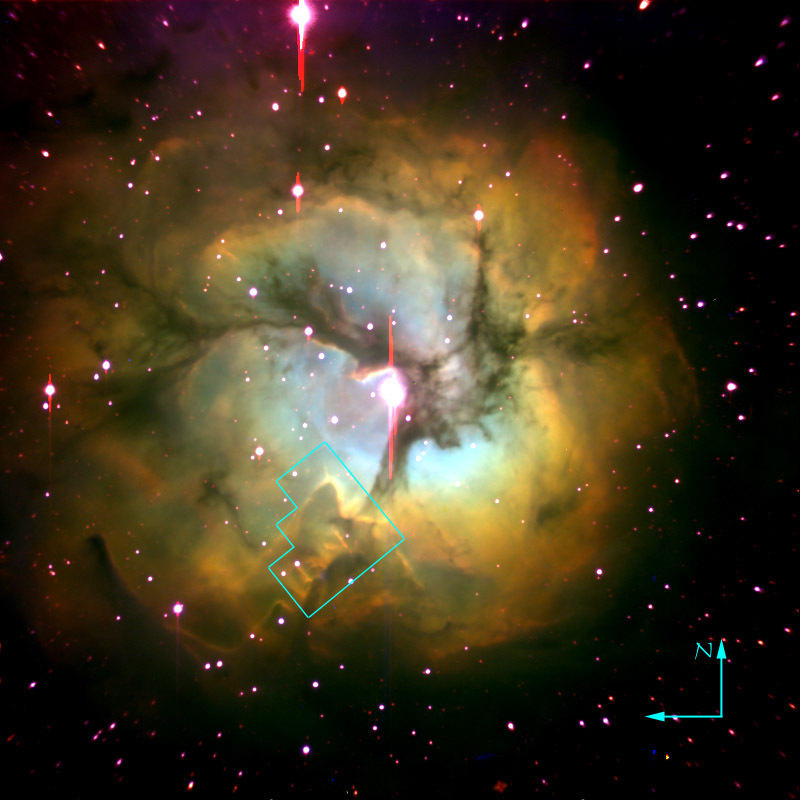 Larger telescopes (150 mm or 6-inch) show the Trifid Nebula’s irregular shape and the three dark lanes spreading from the nebula’s central region. 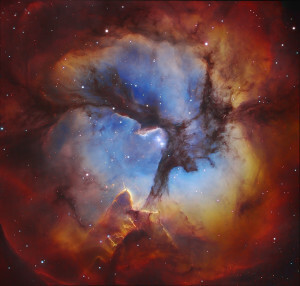 The Trifid Nebula has an estimated age of only 300,000 years, which makes it one of the youngest emission nebulae known. The bright open cluster lies at the core of the emission nebula and is partly obscured by thick dust lanes which block visible light and conceal parts of the nebula’s central region. 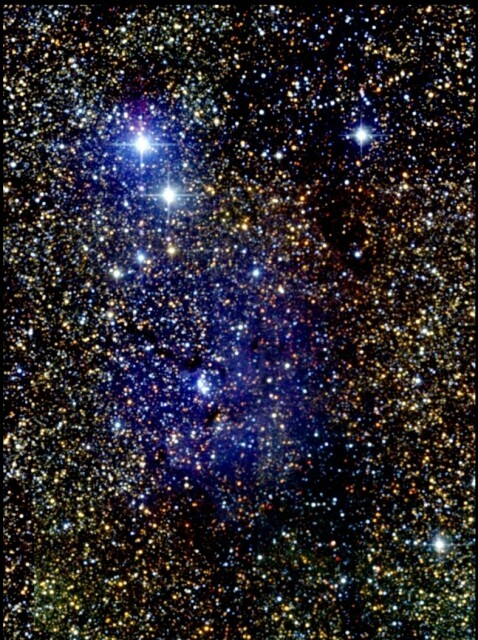 In images, the dust lanes are silhouetted against the brighter nebula in the background. The emission nebula is illuminated by the light of the young, hot, massive class O stars that form the open cluster. The young stars include a triple star system known as ADS 10991, whose primary component belongs to the spectral class O5 or O6 and has a visual magnitude of 7.6. The bright stars within the nebula make estimates for brightness difficult, which is why some astronomers give a magnitude of 6.3 and others, 9.0. The stars’ intense radiation has blown away the dust and gas in the region surrounding the cluster. As a result, there is no star forming activity occurring in the vicinity of the cluster anymore. The reflection nebula seen to the north is not physically associated with M20, but merely appears along the same line of sight. The Trifid Nebula was discovered by Charles Messier on June 5, 1764. He described the object as a „cluster of stars, a little above the Ecliptic, between the bow of Sagittarius and the right foot of Ophiuchus.“ Messier discovered M21 the same day. William Herschel gave the nebula four different numbers when he included it in his catalogue in the 1780s: H IV.41, H V.10, H V.11, and H V.12. John Herschel was the one to name the nebula Trifid after observing the dark dust lanes that separate it into three lobes. 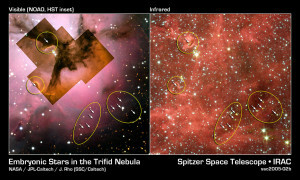 Observations using NASA’s Spitzer Space Telescope in January 2005 resulted in a discovery of 30 massive embryonic stars and another 120 smaller newly formed stars not previously seen in visible light images. 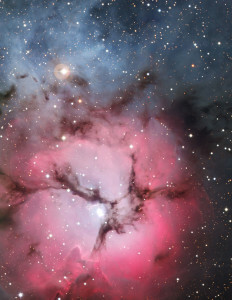 The stars are scattered throughout the Trifid Nebula’s bright clouds and dark lanes of dust. The cloud containing the embryonic stars lies about 8 light years away from the central star of M20. The cloud has a stellar jet about 0.75 light years in length emanating from a young star embedded within the stellar nursery. The jet is illuminated by M20’s central star. To the right of the jet, images of the Trifid Nebula reveal a stalk pointing from the thick cloud to the central star. The stalk is dense enough not to be blown away by the star’s radiation. It is an example of evaporating gaseous globules, or EGGs, which have also been imaged by the Hubble Space Telescope in the Eagle Nebula (Messier 16), located in Serpens constellation. The Trifid Nebula is often mentioned in works of science fiction, including Beast Wars, a series set in the Transformers universe and the Star Trek original series episode “The Alternative Factor,” in which M20 is a portal between two universes. 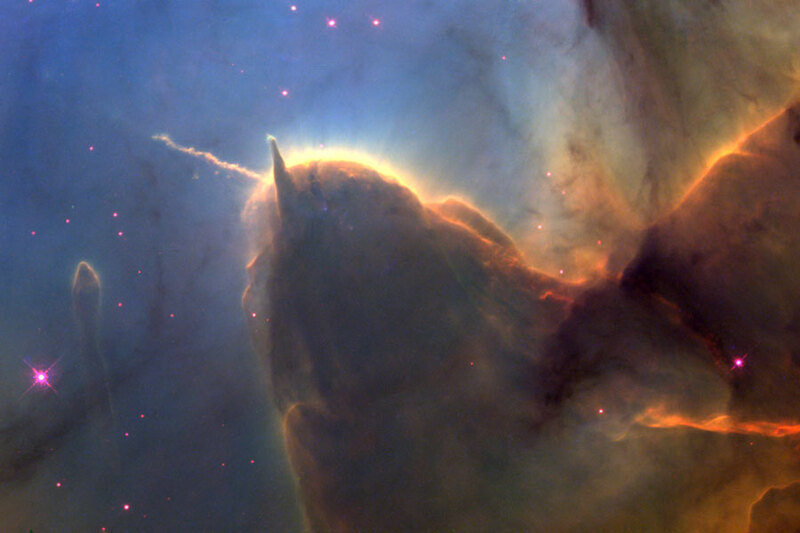 A close detail of the Trifid Nebula. Image: NASA and Jeff Hester (Arizona State University). 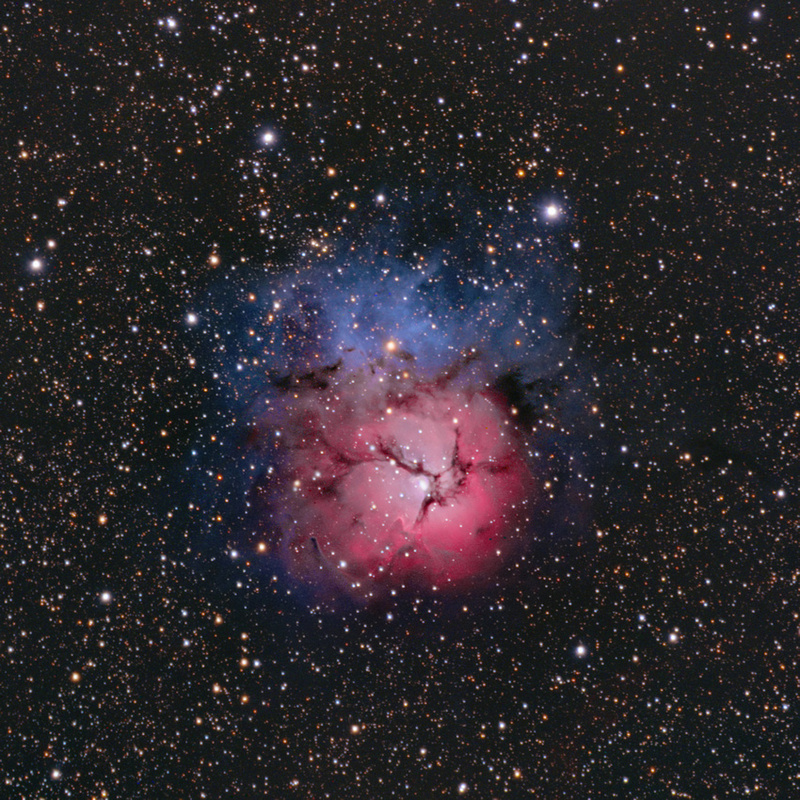 The Trifid nebula (M20, NGC NGC 6514) in pseudocolor. Image taken with the Palomar 1.5-m telescope. The field of view is 16’ ´ 16’. Red shows [S II] ll 6717+6731. Green shows Ha l 6563. Blue shows [O III] l 5007. The WFPC2 field of view is indicated. Image: Jeff Hester (Arizona State University), Palomar telescope. Messier 20: The Trifid Nebula. Image: Two Micron All Sky Survey (2MASS), a joint project of the University of Massachusetts and the Infrared Processing and Analysis Center/California Institute of Technology, funded by the National Aeronautics and Space Administration and the National Science Foundation.